Eclipse is an combined development environment (IDE) for Java and other programming languages like C, C++, PHP, and Ruby etc. 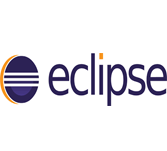 Eclipse development environment includes the Eclipse Java development tools (JDT) for Java, Eclipse CDT for C/C++, and Eclipse PDT for PHP, among others. This tutorial will explain how to use Eclipse for developing any software project using Eclipse IDE by giving special importance to Java project. This tutorial will help beginners in understanding basic functionality of Eclipse tool. After completing this tutorial, you will find yourself at a moderate level of expertise in using Eclipse IDE from where you can take yourself to next levels. before using Eclipse IDE to handle all levels of Java projects development, it will be good if you have knowledge of software development using any programming language specially Java programming.